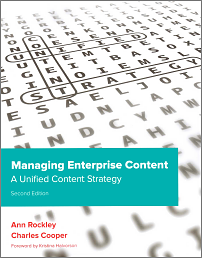 For all you professional writers who struggle with managing mountains of information at work—whether you write technical manuals, marketing literature, training materials, service guides, online help, or what have you—the new edition of Ann Rockley’s classic book, Managing Enterprise Content: A Unified Content Strategy, coauthored with Charles Cooper, calls to you. The illustrations alone make this second edition worth picking up (especially if your boss springs for it). For example, one glance at the beer-can-chicken recipe as it appears in a printed book, on an eReader display, on a nice big monitor, and on a smartphone—and suddenly the abstract discussions of “information modeling” make sense. Rockley and Cooper, along with the many folks who contributed to this book, did an impressively thorough job covering all aspects of content management. Some sentences leave me wishing that the book had gone through another round of editing. (“Structured writing is the way elements in a component are written.” Huh?) But the book’s overall value compensates for its occasional lack of clarity. This book represents a bright light of encouragement and insight for anyone with the courage to follow its authors into content management’s daunting new world. This entry was posted in and tagged Content management, Writing, Writing process by Marcia Riefer Johnston. Thanks for sharing your thoughts, Marcia. And, I agree, the “ah-ha” moments are sprinkled though out this volume and the images bring them home. Scott, You’re welcome. You played a part in making this book what it is, so thanks to you too. You’re welcome, Andrew. Let me know when you’ve posted your own review of this book.